Metroidvania, in which we play the role of a dead warrior who travels through the gloomy land. The game in Unworthy is primarily about exploring gloomy places and fighting with the masks that live there. Unworthy is a metroidvania. The game is a debut project of Aleksandar Kuzmanovic Games, an independent studio from Canada. 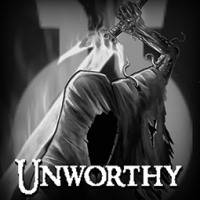 In Unworthy, we play as an unnamed warrior who was raised from the grave. In order to prove that he is worthy of eternal rest, the protagonist has to travel through the dark land and face the dangers lurking there. In Unworthy, the action is preseted from a side perspective. During the game, we mainly explore gloomy locations and fight enemies, including powerful bosses. During the battles, it is necessary not only to show our reflex and dexterity, but also to carefully observe the movements of adversaries and look for gaps in their defense. As we progress, we increase our combat potential - the equipment we acquire along the way and the unlocked skills also allow us to reach new places. Unlike the heroes of most other games of this type, the protagonist is not able to jump here. Unworthy uses monochromatic graphics made in pixel art. The grim atmosphere is intensified by the soundtrack.